The purpose of this short note is to walk through some of the equations used for the "Black Swan Ponds"in a recent visualization I have been playing with. This was done to double-check some things, and serve as a point of reference in case someone finds an issue with the equations that are being used or their implementation. Determination of boundaries of Black Swan Ponds. 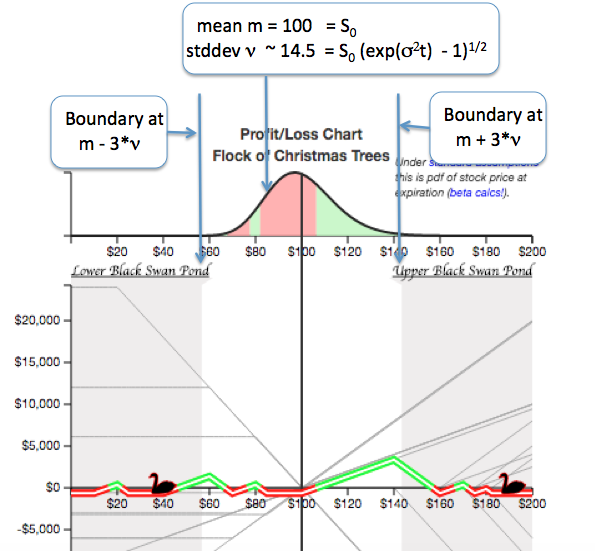 What I am doing is highlighting the region where the stock price after time $t$ is at least $N$ standard deviations from the mean - following "standard" assumptions regarding the stock price' behavior being "geometric Brownian motion". I don't think that there is a definitive definition of the value for $N$ which constitutes a Black Swan. Just that it is "extremely unlikely", relative to standard methods of quantifying probability. I don't think that one wants to necessarily predict/estimate probabilities of them, rather than simply seeing where this region might lie relative to "normal" assumptions - "normal" in both the statistical and non-statistical senses. These are the bounds I am currently using in the visualization, with $N=3$ based on an informal review of a few things on the internet (feel free to suggest a better value). Are Three Standard Deviations Enough? One thing that has struck me here is that the Black Swan Ponds can visually appear to be a bit "closer" than one might expect when using only three standard deviations. Thus, while this might need to be tweaked a bit, the primary purpose of the ponds is to simply try to integrate into the viz information on the potential impacts of the tails that are implied by "normal" assumptions.